There are many cat Christmas dangers people are just not aware of and to be honest it is usually the last things on our minds at this time of year. Amongst all the hustle and bustle of buying gifts, preparing food and parties and decorating the house, our furry friends can sometimes be left out or forgotten about. Unfortunately because of all the new and different things around at this time of year like holly and shiny tinsel, there also lurks cat Christmas dangers, which if we are not careful could turn our season to be happy into a nightmare. As you know cats are inquisitive little creatures and also prone to getting over excited when people are rushing around and there are new things to play with just lying around. 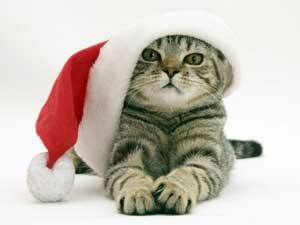 Cats particularly like shiny, sparkly things and crinkly paper, two items that are plentiful at Christmas. The problem is these items can be harmful to your pet if they are left unsupervised. Artificial snow spray  This is the stuff used to spray on windows and trees to make it look lovely and wintery. However it is toxic to cats, so if you must use it, make sure it is used sparingly and not too accessible for possible cat licking. 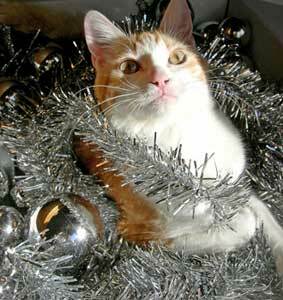 Tinsel and other decorations  Tinsel can be chewed and if swallowed can cause blockages inside the cat. Avoid placing this appealing shiny tinsel in places that your cat will be able to easily reach.That goes for other chewable decorations as well. The best option is to not leave the cat alone with such temptations. I heard once that a cat pulled a glass ballball off of the tree and broke it, unfortunately it then managed to cut its paws on the broken glass, ouch. Chocolate  It is important to make sure that visitors to the house know not to give your cat any normal chocolate when they visit. 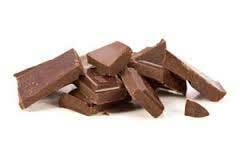 It is very tempting to think that you are giving the cat a treat but normal chocolate contains methylxanthines and theobromides, which are poisonous to cats and dogs. In some cases it can even kill. Plants  another cat Christmas danger is from the lovely seasonal plants we like to bring into our homes at this time of year. Once again plants such as Mistletoe, Holly and Poinsettias are poisonous when eaten. Place them up high and out of reach of twitching noses. If you have a cat that generally likes to nibble the indoor plants, it is strongly recommended that you refrain from bringing these plants in to the home at all. Everyone loves a Christmas tree and that includes our feline friends. It is not uncommon to hear of cats climbing the tree and pulling it over every year.Unfortunately there is not much that can be done to stop a determined cat, but there are a few measures that can be taken to reduce the risk. Buy a tree that does not shed its needles or does not have the very sharp needles. Secure the tree firmly by placing weights at its base and if possible securing the top to something. Place dangly decorations up higher out of paws reach. Place pine cones around the base of the tree. This makes it difficult for your cat to walk close to the tree. Our cats can often feel left out or overwhelmed at Christmas if there are lots of strange new people walking around the house, especially during parties. So to make a real cat christmas for your pet, put some time aside for your cat, where you can make a big fuss of them and help them to feel secure and safe in their home. Another good idea is to make a safe room for your cat to retreat to if it all gets too much for them. Place a note on the door telling others not to enter and place their bed, some toys, litter tray and fresh water in the room for your cat. Don't forget it's Christmas for your cat as well so make sure there is something in their stocking too Chistmas morning, a little cat toy or too wouldn't say.